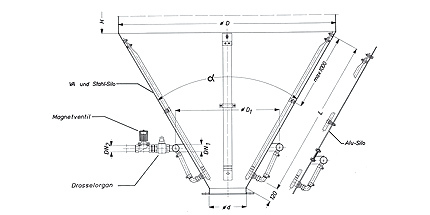 The tube loosening is mainly installed in silo cones. It prevents bridge formation and promotes the flowing out of the product. It is only suitable for use with poorly flowing dust-like products. Gritty and grainy products usually discharge without special measures. The unit consists of diverse loosening tubes which are arranged in a specific way depending on the specified conditions. The compression of the fabric tube is prevented by a spiral installation and almost round cross section. Every decompaction installation is connected to a ring line and can easily be divided into various ventilation fields. A 2/2 way solenoid valve with the required protection type and voltage is used as ventilation valve. Using the decompaction box, emptying of the ventilated silo without residues can normally be guaranteed. The advantage as compared with other discharge equipment is that no moving parts have to be installed. Air is blown via the porous fabric into the fill material to fluidise this and destroy bridges.